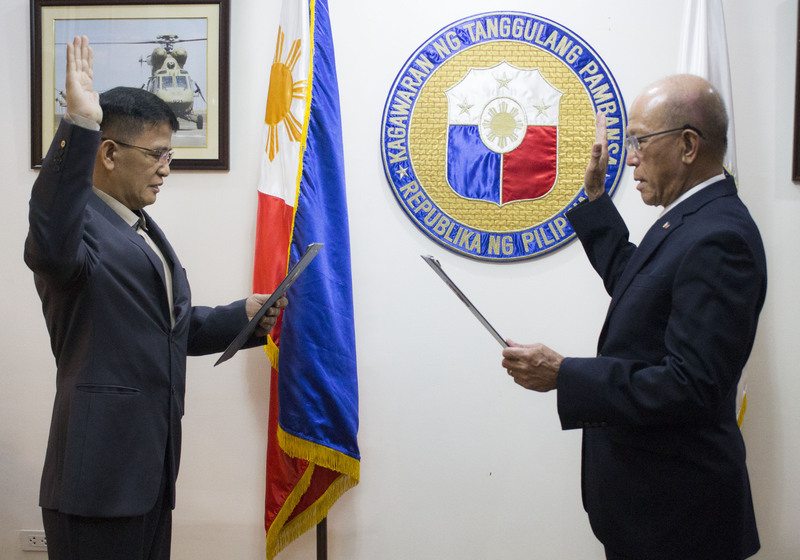 Former Customs Chief and retired Marine Captain Nicanor E Faeldon took his oath as the Deputy Administrator for Operations of the Office of Civil Defense today, 16 January 2018 at the Office of the Secretary of National Defense in Camp General Emilio Aguinaldo, Quezon City. The oath of service was administered by Defense Secretary Delfin N Lorenzana and witnessed by OCD officials led by Civil Defense Administrator Usec Ricardo B Jalad, Civil Defense Deputy Administrator for Administration Asec Kristoffer James E Purisima and other officers of the Department. Defense Secretary Lorenzana urged Asec Faeldon to bring new insights that would contribute to OCD’s development as the country’s lead Disaster Risk Reduction and Management (DRRM) agency. CDDA for Administration, Asec Purisima said it was high time for the post of Deputy for Operations to be filled given that operations services are vital especially on the ongoing disaster operations for prevailing weather disturbances and Mayon Volcano. “I thank the Secretary Lorenzana, Usec Jalad and Asec Purisima for their support. OCD and our people at large can be assured that I will do my best to help OCD achieve its goals”, Asec Faeldon said. The oathtaking was conducted after the Office of the President issued the appointment of Asec Faeldon last December 2017.
agency to address the growing demands of the country’s Civil Defense and DRRM programs.